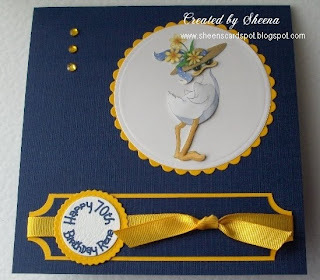 Cardmaking Chaos: Digi Image with Attitude! Should have said from the start I'm no photographer & am using my little digital camera as best I can but please excuse the quality of the pictures. Any advice would be appreciated. This image made me smile when I saw it on pcrafter.com and I just knew what I wanted to do with this Missy Duck with so much attitude! Printed her several times & decoupaged her. Sentiment is printed direct to cardstock & cut out with Nestabilities Circles, as was the image. Used EK Success corner punch on sentiment banner. Ribbon & flat backed gems from stash.